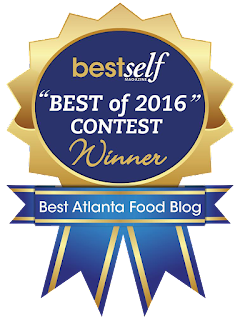 Pomodoro Sauce for Now (or Later) | We Like to Cook! 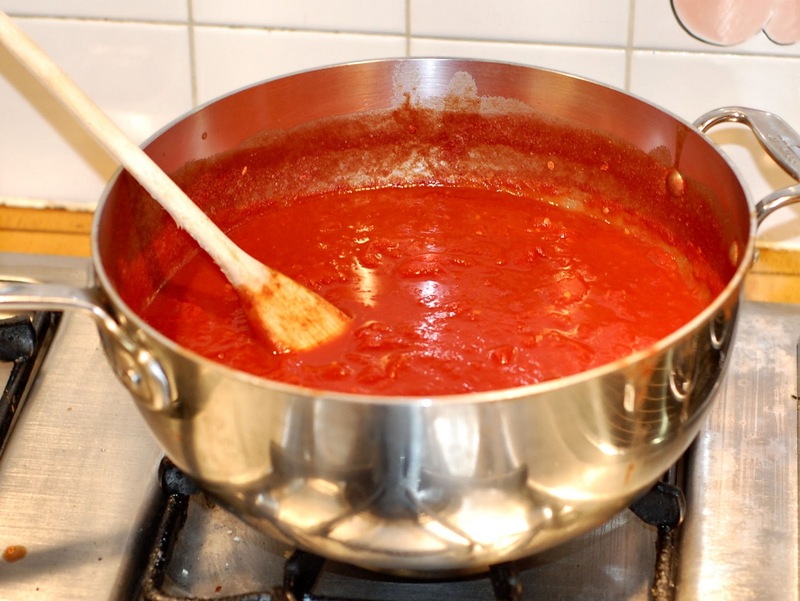 Tomato sauce is the foundation of most Italian dishes, and thus a mainstay of our family diet. All the names and terms for different sauces can be quite confusing; fra diavalo, amatriciana, arrabiata, puttanesca to name a few. All of these start with a basic sauce, either marinara or pomodoro. Marinara (Italian for Mariner's sauce) is a meatless sauce made from roughly chopped fresh tomatoes, olive oil, and garlic. All of these ingredients are placed in a saucepan and allowed to simmer for about 20 minutes. Since the sauce doesn’t cook very long, it retains much of its bright red hue, and the olive oil adds a sheen to it. By adding capers, olives, anchovies, and red pepper flakes to the marinara you will have a quick and delicious puttanesca sauce. Like marinara sauce, pomodoro sauce is also meatless and made from tomatoes, garlic, and olive oil, however, pomodoro sauce is somewhat thicker and smoother than marinara sauce. This is because the tomatoes are crushed and the sauce is simmered over a longer period of time. 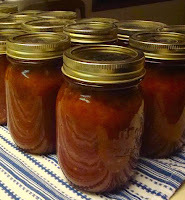 Pomodoro sauce can easily put up in canning jars and saved for later use in numerous recipes including baked ziti, amatriciana, or used for making homemade pizza! This recipe makes enough to cover 4 pounds of pasta (or 3 pounds of pasta generously). You can also toss the leftovers in the freezer if you're not up to a canning project. Add olive oil to a large saucepan, and warm over medium heat. Add minced garlic and cook until lightly brown. Do not overcook garlic or it will taste bitter and ruin the flavor of the sauce. Remove pan from heat and add tomatoes. Wash hands and hand crush tomatoes until they are the consistency you prefer. Don’t be afraid to get your hands messy! After crushing tomatoes, add salt, paprika, peppers, sugar, and oregano, and stir together. If you prefer a smoother sauce, you can use a hand mixer or immersion blender to puree the sauce further. Place saucepan back on medium heat and bring the sauce to a boil, then turn heat down to a simmer. Add cheese rinds (or ½ cup grated cheese) to the sauce and allow to simmer for 30 minutes to one hour. Turn sauce off and allow to cool fully. Letting the pomodoro sauce cool allows the flavors to meld. Bring the sauce back up to a boil before serving. To serve, place cooked pasta of your choice in a large serving bowl and add about 2 cups of sauce stirring to coat and set let stand for 5 minutes. Serve pasta in bowls with additional sauce and copious amounts of grated Parmesan cheese. To be safe, it is always a good idea to sterilize your jars and lids. Wash jars in hot soapy water and rinse well, and then place in a large pot of water and boil gently for 10 minutes. Remove and drain on a clean towel until ready to fill. Fill a large pot with enough hot water to cover the jars with 1 to 2 inches above the tops of jars. It is always a good idea to have extra hot water in case you underestimate. 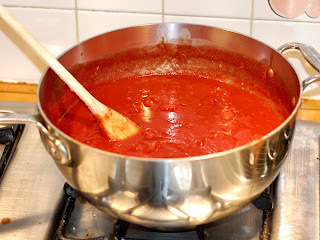 Pour hot pomodoro sauce in clean jars and wipe rim clean of any excess. Place the lids on your jars of sauce and hand tighten. Place in the pot of boiling water and cover with 1 to 2 inches of water and the pot lid. When the water comes to a rolling boil, start to count the processing time (which differs for the size of the jars you use, so follow package directions). Reduce heat slightly and boil gently for the time recommended for the food being processed. When the cooking time is up, remove jars at once and place on a rack or on towels away from heat and away from any draft. Keep jars separated to allow air space for cooling. After jars have cooled, test the seals by pressing down on the center of the lid. The lid should be concaved and not move when pressed. Be sure to label canned jars with contents and processing date. Store jars in a cool dark, dry place.